I was driving home from Philadelphia this past Sunday after a wedding, when I learned about the dietary habits of Attorney Rand Spear. The story is nothing new. And, apparently, Mr. Spear holds a trademark in that phrase. This serves as a reminder that phrases can be trademarked. Other well-known phrases have been trademarked, e.g., Coke is it! (cancelled). Some are completely random: I love what you’ve done with the trash! A phrase that is trademarked, like a logo, may also enjoy copyright protection. And the misuse of a trademarked phrase could wind up subjecting a defendant to both copyright and trademark liability. The defenses might not necessarily be identical and even if one count is thrown out, the other might survive. For those wondering: Lawyers may or may not be permitted under state ethics rules and the First Amendment to advertise their gustatory predilections, though the 2nd Circuit’s decision in Alexander v Cahill (cert. denied) is persuasive (Heavy Hitter attorneys prevailed). It is unclear if Mr. 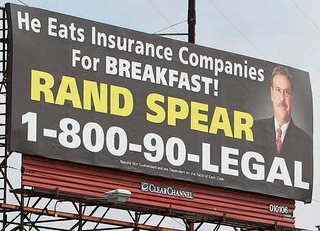 Spear literally or figuratively eats insurances companies for breakfast or any other meal. Personally, if my last name were “Spear”, I’d be using imagery invoking my name rather than my gut. Something a bit more fun. Forgetting, for a second, the outcome of that fight (spoiler alert!!) isn’t that a better lawyer vs insurer image? This entry was posted on Tuesday, August 4th, 2015 at 4:16 pm and is filed under advertising law, trademark. You can follow any responses to this entry through the RSS 2.0 feed. Both comments and pings are currently closed.